Normally I’d be announcing another Summer Surprise sale, but to celebrate the holiday weekend I’m offering 20 percent off all Murania Press books, not just one. The sale is limited to Murania Press books only, not issues of Blood ‘n’ Thunder. 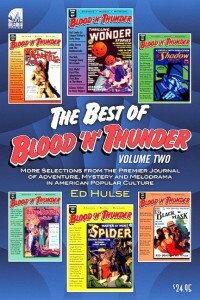 But it gives you another opportunity to load up on both Best of Blood ‘n’ Thunder collections, Blood ‘n’ Thunder’s Cliffhanger Classics, and previous entries in our Classic Pulp Reprints series. Like the regular Summer Surprise sale, this Holiday Weekend sale continues through Sunday evening and ends at midnight.